I created a name for people who crowd the gym in January to “get in shape” – New Year’s Resolutioners. These are the people filled with gusto in January proclaiming their commitment to lose weight, exercise, and get it shape – for real this time. And it lasts three to four weeks before the snooze button wins over and the crowds thin out. Each year there are also several who win the battle and become regulars. Unfortunately there are not many, although it does reduce the traffic and crowds at the gym… This morning they were out in force when I arrived at the pool at 6:15 AM. Every lane in the 5 lane lap pool had at least one swimmer. By the time I changed and made it out to the pool some where leaving as we arrived. I swam with up to five friends this morning and we all had to share lanes at some point. Three to four of us followed the same workout and we were very close in pace. It was fun and challenging to push to keep up. My fatigue from not resting is showing and I was just a few feet back in most of the sets. I still swam a strong workout of 2,800 meters. This evening I road a spin bike for a 50 minute workout my coach gave me. A continuation from this morning with the crowd, all but two bikes were filled. Fortunately the one I got on had a working computer. Many of the cycle workouts I have been given are focused on getting me used to riding at 90 rotations per minute (RPM) along with different intensities. This is beneficial in both training my legs how quickly to turn over and developing strength to push faster. As I ride more, I want to monitor my progress not just in speed by strength. This is accomplished from a power meter. The spin bikes have them, how accurate they are remains a question. I also have been researching a power meter for my bike. Finding the right one is tough – first they are expensive and second which type. I tried the heart rate strap method and it did not work well. So I am in research mode and will report my findings when I find them. It was one of the most beautiful sunsets I have seen. 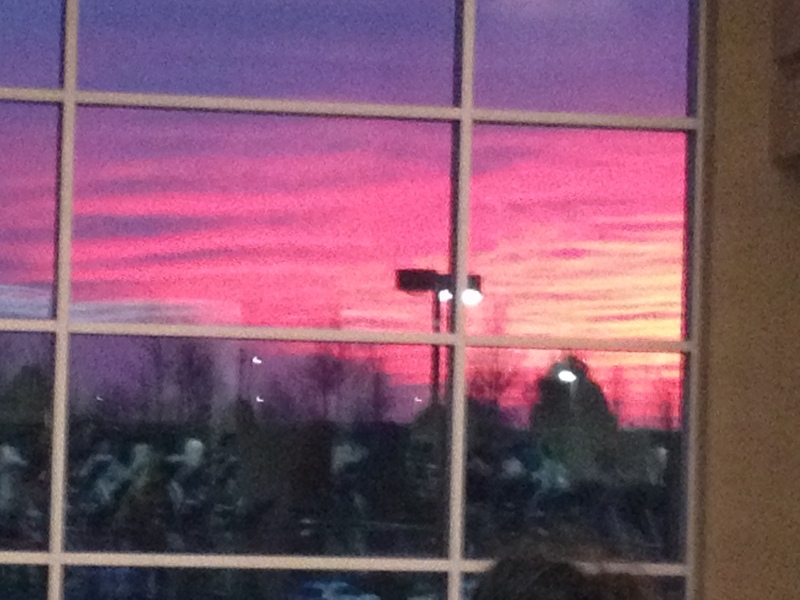 A quick Google search taught me that the midwest winters tend to have the most colorful sunsets. It also said that most likely the same time I saw this sky, the Rockies probably had a beautiful deep blue late afternoon sky. Regardless of how it came to be, it was a lovely reminder to look up. Even something little like a breathtaking sunset offers a ray of joy in the day. It was the perfect ending to behold on a not so perfect day. I definitely have seen the impact of “New Year’s Resolutioners”! I went to a yoga class on January 1st, and it was absolutely PACKED – I had gone to the exact same class two weeks before and there were four of us in the studio! There are also 100+ people attending the Zumba class that my college offers – that’s at least four times as much as it was before Christmas break! While I truly think it’s great that people are focusing on their health, part of me is selfish: I want my space in the gym back! I understand how you feel! Thank you for commenting! I like the phrase, “New Year’s Resolutioners” — now you can come up with a term for the folks who will buy a $5,000 carbon fiber bike in April and then permanently hang it in their garage in June. Thank you for commenting. How about Wealthy Wannabes? I love the New Year’s Resolutioners: 1) By signing up for memberships, they help keep my gym fees down and 2) The few that stick it out make me so happy. I love watching their bodies transform (and I’m sure to say something to them once I notice even the smallest changes to keep them encouraged). You have such a positive attitude! Absolutely. And I like that word – stunning! Must use it more often. Thanks for another great post. Have you read contemplativefitness.wordpress.com yet? If not, I think you’ll find his latest post “Never Mind. Always Mind…” inspiring. You amaze me with how you forge on day in and day out. Keep pushing yourself! I will check it out, thank you for the suggestion. It is ironic that today you wrote that you are amazed at how I forge on. Today I took a complete rest day. The forging has me exhausted! Thank you for commenting!